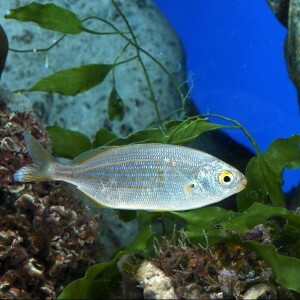 Saupe is silver-coloured with 10 or 12 golden longitudinal bands and a yellow eye. It has a black stain right on the base of the pectoral fin. Its maximum size is 30 cm. They normally swim in groups, forming schools that are easily recognisable thanks to their proximity, their discplined behaviour and because they swim very close together. The fact that they form schools is a strategy used by many fish as a defence and to facilitate reproduction and feeding. They are herbivorous animals that feed on the algae covering rocks and grass, such as Neptune grass (Posidonia oceanica). It is an oviparous species, the spawning (egg laying) takes place in early spring and late autumn. The saupe is a fish that lives in shallow waters and never below 15 m. The schools of youngsters may feed in waters of under 1 m in depth, where they are dragged to and fro by the waves. They are in the Mediterranean and the Atlantic ocean from the Bay of Biscay to South Africa. It is the only animal that can feed on the so-called “murderer algae” (Caulerpa taxifolia), which contains a toxin called caulerpina, that other animals can not tolerate.